I collected 35- 3″ circles and 35 bottle capes. 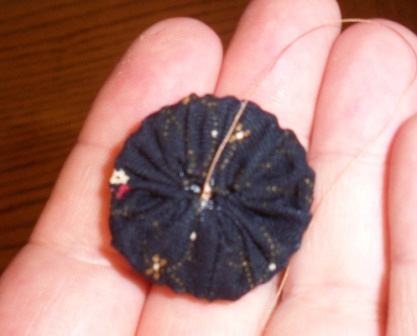 I took needle and thread, turned over the edge of the circle a bit less than 1/4″ and ran a running stitch all the way around in the folded edge. 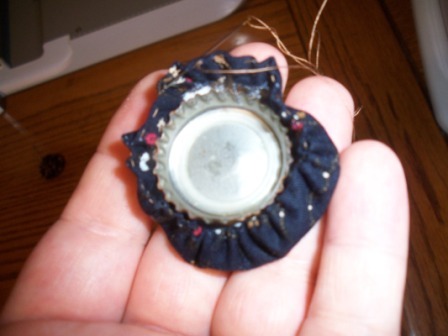 I put the beer top into the gathered circle and gathered up the thread. Then I tied a knot in the thread. Now the edges didn’t quite all come together so instead of clipping the thread, I caught the opposite side of the circle and pulled it tight. 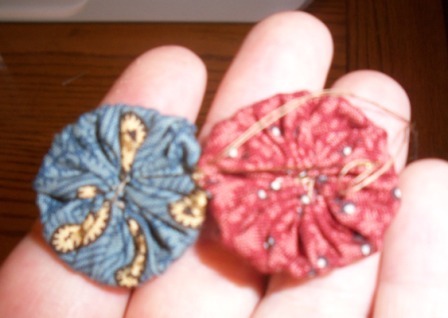 Then I caught the two sides and pulled them in as well until it looked like this. I tied it off and made a couple more. Next step was to tack them together. At this point, just keep covering your bottle caps and tacking them together. I am opting to make an eclectic version and not a patterned one like I had purchased. If you want a good chuckle, you can check out a video of me making the trivet on YouTube.